Josephine Shea raises funds for state Treasurer Timothy Cahill. A longtime political supporter and fund-raiser for state Treasurer Timothy P. Cahill is collecting the kind of lucrative pension typically reserved for public safety personnel such as police and prison guards, even though she held administrative jobs in the Norfolk County sheriff's office. Cahill voted to approve the hazardous duty pension for Josephine E. Shea in 2000, while he was still Norfolk County treasurer and chairman of the Norfolk County Retirement Board, according to public records. Shea, who retired that year at age 49, has been collecting a pension now worth $47,000 a year, plus health-care insurance, paid by Norfolk county taxpayers. If she had received the kind of pension usually given to sheriff's department administrators, instead of the type Norfolk corrections officers get for their potentially dangerous jobs, her pension would be worth less than half that, $21,230 a year. Shea, now 57, declined to be interviewed. Responding to written questions from the Globe, she released a statement touting her "22-year career as a corrections official." She said she qualified under state law for the same kind of enhanced pension awarded to corrections officers at the Norfolk County sheriff's office and Correctional Center. "I was responsible for the care and custody of the inmate population, including murderers and other violent criminals," the statement said. Shea declined to address questions about how often in her career she had contact with inmates, one measure for determining eligibility for enhanced benefits, or to give details of her duties. Cahill also declined to be interviewed. In a statement, he said he did not remember his July 26, 2000, vote approving Shea's retirement. "It was almost a decade ago, and I don't remember the specifics of the case," Cahill said in the statement. Shea has since embarked on a second career as a broker for firms seeking to invest state and county pension funds; her firm earned what is estimated to be a substantial fee for helping to arrange a deal for an investment management firm to handle $250 million from the Massachusetts pension fund, which is overseen by Cahill. "I don't see a lot of stress on a paper-pusher, not compared to an officer who might get stabbed or beaten up on the cellblock," he said. "These retirements are meant for officers who get old before their time under the stress and physical demands of the job." A corrections officer - William Farretta, a sergeant and 20-year veteran of the Norfolk sheriff's office - said Shea did not deserve the higher pension. "The higher pensions should go only to those who actually work with inmates and put themselves at risk," Farretta said. "Shea was at not at risk. She was in the front office." A Group 4 public safety pension of the type Shea received is one of the most lucrative prizes under state pension law, delivering hundreds of thousands of dollars in extra lifetime payments to retiring public employees who put their lives on the line every day. Police officers, firefighters, and prison guards are entitled to it. Many of them retire with weakened hearts or bad backs and stress borne of hazard on the job. Actuaries predict shorter life expectancy for them, compared to white-collar workers. Other office administrators have won hazardous duty pensions from the Norfolk sheriff's office. In 2001, Robert Cerasoli, the state inspector general, took a $28,000 pay cut to be assistant deputy superintendent of internal affairs and financial oversight. He retired a year later with a hazardous duty pension, good for $91,000 in annual pension. Michael T. Maloney, a former state Department of Correction commissioner, also won a hazardous duty pension worth about $90,000 after joining the Norfolk corrections system as an administrator. Shea's title for most of her tenure was deputy superintendent for administration and finance, overseeing what is now a budget of about $35 million and 317 employees. 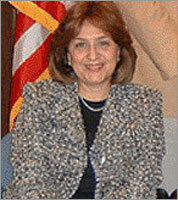 When Shea applied for retirement in 2000, her title was temporary special sheriff, records show. Before that, her prior title was special sheriff. Each title carried administrative duties. "Special sheriff does not get you into group 4," said Joseph E. Connarton, executive director of the Public Employee Retirement Administration Commission, a state agency that oversees and regulates pension administration and the 106 pension boards in the state. Shea's work for Cahill, a Democrat, extends back at least to 1996 when she was actively raising funds for his campaign to become county treasurer, according to three Quincy Democrats who observed their relationship. She also used her contacts from having served on the retirement board to round up support for Cahill around the county. Shea again worked closely with him in his 2002 campaign to win the state treasurer's post. After he took office, she continued to be on his inner financial team that met in Quincy, sometimes weekly, to plan fund-raising for Cahill's political account, said two Cahill supporters. Shea has also donated to Cahill's coffers, more than $3,000 since Cahill won election as state treasurer. The five-member Norfolk County Retirement Board approved Shea's pension with no questions asked, minutes show. At the time, Cahill was chairman, and Shea was also a member of the board (and still is). Neither Cahill nor Shea recused themselves from the July 2000 vote, according to minutes of the meeting, which state that the vote was unanimous to approve a batch of pension requests, including Shea's. Shea did not respond to written questions about her participation in the vote on her retirement. State conflict-of-interest law generally prohibits officials from voting on matters that affect their own financial interests. Responding to written questions, Cahill said in the statement, "Ms. Shea has been generally supportive of me, and I'm grateful for her support." After she stopped working at the sheriff's office, Shea began work as a pension investment consultant for Connors & Co., a Georgia company that earns fees by matching investment companies with state and local pension funds. Shea is the firm's director of sales and marketing for New England. In a 2000 letter to Cahill and her other colleagues on the Norfolk Retirement Board, Shea described her desire to continue working after her tenure with the sheriff's office. "Not one to sit idly, I subsequently became a consultant," she wrote. Paul F. Connors Jr. and his wife have been longtime contributors to Cahill's campaign committee, dating back to when he was first elected county treasurer. Since Cahill was elected to the state post in 2002, they have contributed $12,000. Connors could not be reached yesterday; he has previously not responded to requests for comment about his firm's dealings in Massachusetts. In October 2005, the state retirement board chose EARNEST Partners, an Atlanta-based financial firm, to manage $250 million in pension money. EARNEST used Connors & Co. as a broker on the deal. Cahill also chaired the selection committee that reviewed the proposals. If normal industry standards were used, Connors & Co. would have earned between 1 and 12 percent of the $6.8 million fee that the state pension board paid EARNEST to manage the funds. EARNEST's disclosure statement did not include the fee Connors & Co. received. Cahill served on the state pension board selection committee that recommended EARNEST and also voted for final approval. He has said he does not excuse himself from participating, even if his political supporters are involved, because he is not told which third-party brokers helped arrange an investment. Connors & Co. was the third-party marketer when money management firm Invesco was chosen by the Norfolk County Retirement Board to handle $3 million of its funds in 2005. The agreement called for Connors to get 25 percent of Invesco's advisory fee, which, if industry standards were followed, would be been as much as $90,000. Shea abstained from the vote. Uncovering pension abuse in Massachusetts.